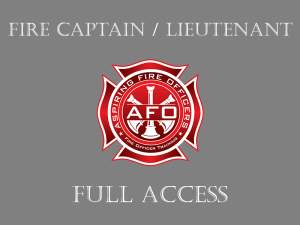 Join now and receive complete access for 4-months to all content included on the Aspiring Fire Officers website. The areas we focus on are: emergency scene fire simulations, fire department promotional oral interviews, fire department in-basket exercises, fire department writing assignments, and firefighter employee counseling. The Emergency Scene fire simulation section includes 24 dynamic, 24 static and 24 practice fire simulations. A dynamic fire simulation involves role-players assuming the role of units on the incident. They respond to the candidate as if they are talking over the radio. The intent is to simulate a real incident. A static fire simulation is best described as the candidate looking at a photo or computer generated image and explaining how he or she would manage the incident. Both dynamic and static fire simulators are used in fire department assessment center examinations. We believe that by running each incident as a dynamic fire simulation and then as a static fire simulation, our members are prepared for either format on the day of their fire assessment center. We also provide a third practice video where the only verbal is the units arriving on scene. This provides you the opportunity to manage the emergency incident as a Fire Captain / Lieutenant and apply what you have learned to build your confidence and skill level. In addition, we have also developed specific videos that break down each portion of the fire simulator exam. These videos are titled: Two-Out/IRIC, “Pre-arrival Considerations”, “The Initial Report”, “Using Proper ICS” and “Transfer of Command”. In both the static and the dynamic fire simulations there are additional learning opportunities. Following the dynamic fire scene simulations, we explain why the incident commander took the actions they took. These “decision points” enhance the learning experience for our members by helping them see the decision-making process needed for a high score. The dynamic fire simulations also include a thorough transfer of command to the arriving chief officer. This is another common practice in the fire simulation portion of an assessment center. Following the static fire simulations, the raters ask a series of questions of the candidate. These questions are consistent with questions that would be asked to a candidate following a fire simulation in a fire assessment center. Another component of the website is the Oral Interview section. To begin, our members view our custom video titled “Oral Interviews”. This video provides specific and focused tips on how to score well in the process. Next, our members open the files containing the fire department promotional oral interview questions. Each question has an example of a complete answer. 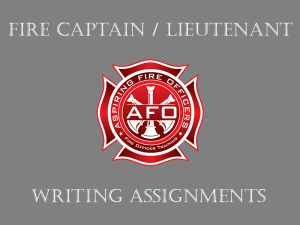 These are a compilation of over 75 pages of fire department promotional interview questions and answers that have been used in fire department assessment centers across the country. We do not advocate trying to memorize the answers, rather we believe it’s important for our members to understand and embrace the concepts for a great response to each question. 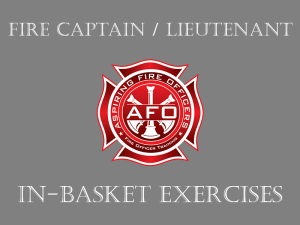 The In-Basket exercises are a series of administrative challenges that a fire officer could expect during a hectic morning at the fire station. Our members begin with viewing our custom video titled, “In-Basket Exercises”. In the video we teach our members how to prioritize each item and how to fully manage it to earn the maximum amount of points. The Employee Counseling scenarios provide our members with unlimited access to 9 video based scenarios. These scenarios are typical of those that you are likely to encounter during your fire department assessment center exam. Each video begins with a written explanation of the scenario that plays across the screen. Next, a veteran fire officer conducts the counseling session using the 8-Step Process. To enhance the learning experience, each step of the 8-Step Process is shown on the screen. This allows the student to see the 8-Step Process in action and reinforces the learning experience. The employee counseling portions of the fire department assessment center exam are challenging and often have a difficult or contentious role player. Because of this we have scenarios where the firefighter is difficult to manage and does not initially go along with or comply with the officer’s plan. Lastly, when you get promoted it is likely you will encounter a firefighter similar to what you have see in our video based firefighter employee counseling scenarios. This ensures that you are not only prepared for the exam but, more importantly, when you get promoted. Following each scenario is the written transcript of the employee-counseling scenario. Members can follow along with the video and highlight key words that they then are able to use when conducting their own fire department employee counseling session.